Be the first to share your favorite memory, photo or story of Alice . This memorial page is dedicated for family, friends and future generations to celebrate the life of their loved one. 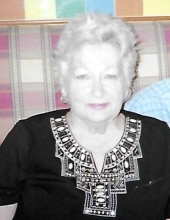 Alice E. Long, 86, of Red Hook, NY, died Thursday, January 10, 2019, at Vassar Brothers Medical Center at Poughkeepsie. Born on Saturday, June 25, 1932, in Arkansas City, KS, she was the daughter of Grover Columbus Orvis and Ruth Myrtle Marshall Orvis. Alice retired from IBM, Los Angeles, CA, where she worked as a keypunch operator for many years. Alice is survived by a son and daughter-in-law, Mark and Cindy Long, Staatsburg, a son, Michael Long, Capitol Heights, MD; grandson, Mark A. Long, Pleasant Valley; granddaughter, Sarah Hannah Long, Staatsburg. She was predeceased by her brother, Marion Orvis, who died in 2000. To plant a tree in memory of Alice E. Long, please visit our Tribute Store. "Email Address" would like to share the life celebration of Alice E. Long. Click on the "link" to go to share a favorite memory or leave a condolence message for the family.